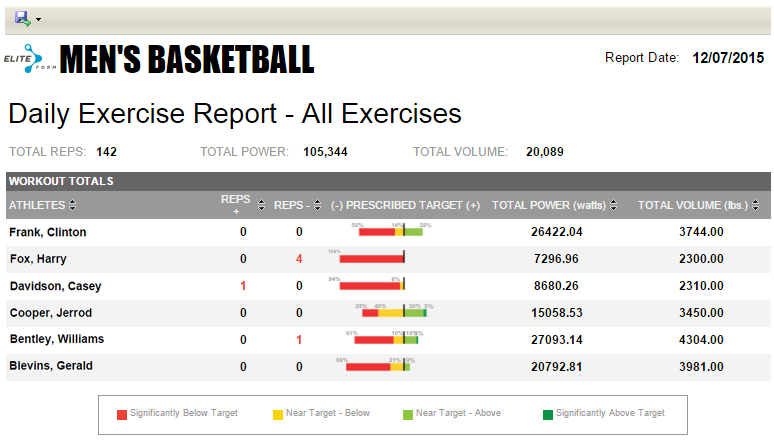 New Daily Exercise Report – The new Daily Exercise report is available from the Reports section. This provides a list of every athlete on the team and their daily totals of reps, power, and volume for either a selected exercise or for all exercises. The report can be generated to include either peak or average velocity. REPs + and REPS – indicate the number of extra reps performed and reps not performed relative to the number prescribed by coaches. Reps with velocities up to 15% above the target velocity are classified as Near Target – Above and are colored light green. TOTAL POWER and TOTAL VOLUME indicate the amount of watts and total weight lifted by each athlete. Additionally, any athletes absent from the selected workout date are listed in the Absent Athletes section at the end of the report. Updated Report Date Range Selection – Controls used to select the date range for reports is updated to help the user ensure valid dates are selected. Previously, a user could select any end date for a report. However, the report would only be generated for the most recent full week or weeks. For example, if the start date was “08/01/2012” and the end date was “08/10/2012”, the report would only be generated for the full week of 08/01/2012 – 08/08/2012. Now, after the user specifies the start date, StrengthPlanner automatically generates a list of valid, weekly intervaled dates that the user can select. For example, with a start date of “08/01/2012”, only “08/08/2012”, “08/15/2012”, and “08/22/2012” can be selected.